Sometime this past spring it dawned on me that a show on Broadway was getting some attention. Apparently it was about the founding fathers. And it included… rap? Hmm… interesting. In early summer I finally realized that this show mattered to our culture. (Yes, I’m slow sometimes.) In July I traveled to New York for a church meeting. 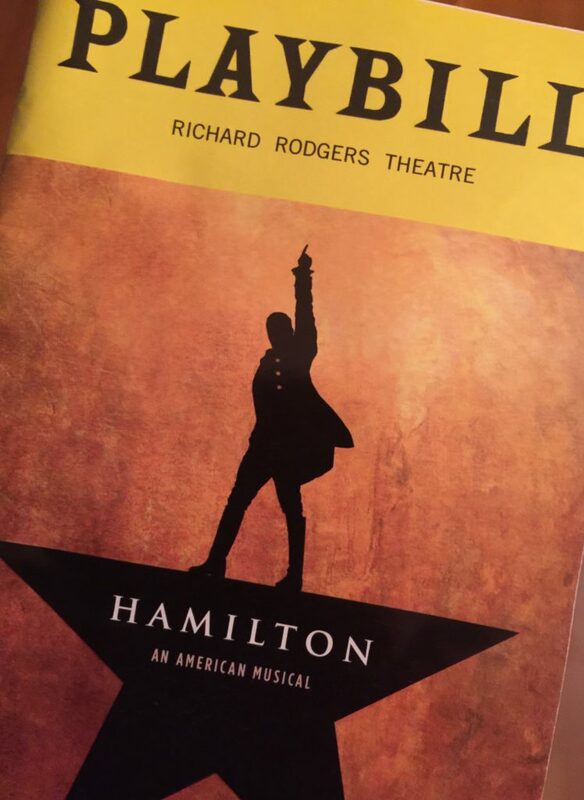 Through a combination of luck, grace, extravagance and curiosity I ended up seeing Hamilton on Broadway. I avoided listening to the music ahead of time. I had hoped I might have the chance to experience everything all at once. That is exactly what I did. From the first note to the last I was transfixed. Never before have I paid $500 for something and ended up feeling it would have been worth ten times that amount. It is now October. Ever since July, I have been playing the Hamilton soundtrack on repeat. The last song is haunting. …when you’re gone, who remembers your name? I’m old enough now to recognize that this song isn’t just about Hamilton. It’s about me too. It’s about the stories I tell of my parents and grandparents. It’s about the stories that will be told about me after I’m gone. What will my children and grandchildren remember? What will turn out to matter to them? And this song makes me incredibly grateful for St. Luke, whose feast day is today. Four gospel-writers sat down to record the story of Jesus Christ and his ministry on earth. It was undeniably essential. But only one of the four kept going. Only one tells the story of what happened after Christ’s death, resurrection and ascension: St. Luke, who also wrote the Acts of the Apostles. Only Luke records the gift of the Holy Spirit at Pentecost. Only he tells the story of the apostles sharing their possessions. He alone tells the story of Stephen’s martyrdom, Philip’s preaching, Lydia’s conversion and all the other details of early church life. Only Luke tells the story of the church’s first generation, who proclaimed with their lives – and often, their deaths – the story of Jesus Christ. Only Luke tells the story of the gospel reflected in very ordinary human lives. Like mine. Our stories matter because we are made in the image of God, because the purpose of our lives is to glorify God and enjoy Him forever. Our story is forever changed by knowing and following Jesus, just as theirs were. The church exists to tell stories. Every week we tell the stories passed down through generations in Holy Scripture. We remember those who have passed from our midst: the saints of old and the saints of yesterday. We recall their quirks and their gifts. We look for the ways God has shaped our lives through theirs. St. Luke, the beloved physician, knew that every life has a story. I am even more grateful for his words than I am for Lin-Manuel Miranda’s phenomenal musical. St. Luke reminds me to live a story worth telling: a story that continues the story of Jesus Christ. Almighty God, who inspired your servant Luke the physician to set forth in the Gospel the love and healing power of your Son: Graciously continue in your Church this love and power to heal, to the praise and glory of your Name; through Jesus Christ our Lord, who lives and reigns with you, in the unity of the Holy Spirit, one God, now and for ever. Amen. How are you inspired by Hamilton? By St. Luke? What a beautiful meditation. The similarity is obvious once you share it. I’ve always found that song haunting. Thank you for reflecting on it so well, I’ve shared this with my own kids, 20 & 17, who play the soundtrack endlessly. So glad to know these words reached not only you but also your almost-adult children! Our stories are so important for the continued sustainability of the church and our faith.